Welcome! The aim of the Isaac Newton Learning Centre Project is to establish St John the Baptist Church in Colsterworth, Lincolnshire as a national and community learning and engagement centre, drawing on its rich Newton heritage. The purpose of this web site is twofold: firstly to provide an accessible public record of the project progress to completion. Secondly, on completion of the project, it will become a “brochure site”, attracting not only local visitors, but visitors from around the world to the Learning Centre. Isaac Newton was born on 25th December 1642 in nearby Woolsthorpe, where his home, Woolsthorpe Manor, is now managed by the National Trust. It is a popular venue for visitors from home and abroad attracting over 40,000 people a year. Woolsthorpe is a conjoined village with Colsterworth. 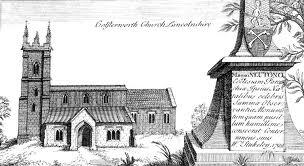 Isaac Newton was baptised at St John’s, Colsterworth in the following January. The Newton family worshipped there and his parents, Isaac and Hannah, are buried beneath the floor of the vestry. The birth and baptism of Newton are recorded in the parish register. One of Newton’s gifts is a sundial on the south side of the church. Another sundial, carved by Newton aged 9 with a pen knife, can be seen in what was the Newton family manorial chapel. This chapel is currently used as the church vestry and has been rarely seen by members of the public. A silver communion paten and chalice, hallmarked 1678 and 1679, may have been donated by Isaac in memory of his mother, particularly as he was a known benefactor of his local church.